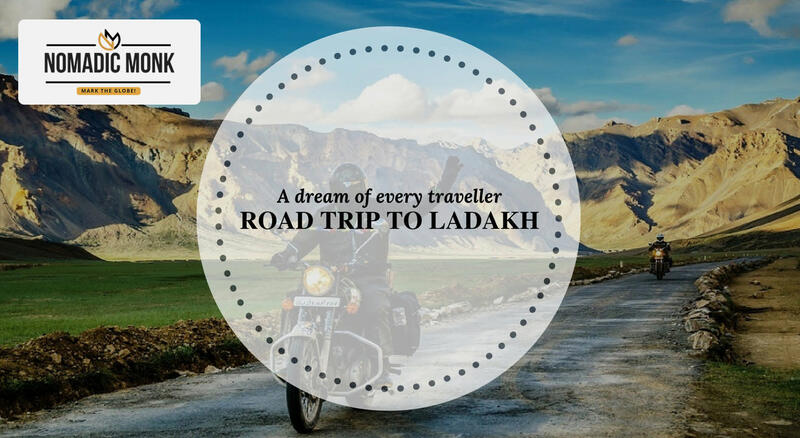 Curvy roads, adventurous riders, high altitude, mountains that is what makes Ladakh a special destination, no doubt it is on every traveler’s wish list. 13 days on the road, high level of adventure, a group of strangers that comes together to accomplish the road to the WORLD’S HIGHEST MOTORABLE ROAD. A power-packed tour of 13 days starting from Delhi en route to Ladakh crossing the highest passes of the world ending at Srinagar. Here, the forces of nature have conspired to render a magical realist landscape of extremes, desert and blue water, burning sun and freezing winds, glaciers and sand dunes. Tibetan traditions and culture remain apparent. At 5 pm report at New Delhi Volvo point(you will be updated with the exact location later) and board your bus for Manali. It would be an overnight journey to Manali. Arrive Manali , meet our representative . Get check in at our pre booked hotel. After some rest proceed for sightseeing. In evening return back to the hotel for “WELCOME PARTY”. Sing, dance make new friends before we head to Leh. Depart Manali early in the morning our first halt is Marhi A barren landscape offering extensive views of the valley and the mountains. We proceed to Rohtang Pass 3790 M is most popular with visitors, being one of the highest road point and gateway to LAHAUL and SPITI valleys. Pass remains closed during winter due to heavy snow from November end to May end. Visitors can drive upto MARHI below ROHTANG with similar high altitude topography, forest of Birch, Fir and Spurce. Once we cross the Rohtang Pass border we are in the Barren Himalayas with the landscape completely changing Khoksar is the first village and gate way to Lahaul. Get prepared for the most interesting overland high altitude drive up to Leh. May take approx 10 hours. You will arrive at Darcha ( 3500 Meter) is situated at the junction of Yotche Nullah and the Zangskar chhu which takes off from the Shinkun la. Both these nullahs meet with the main river Bhaga at this place. This is the main point for the trek lovers wish to enter in Zanskar valley or up to Leh. Your drive from this place will take to BaraLacha Pass ( 1620 Ft) and further drive to Sarchu which is nearly the mid point of Manali Leh route. Continue drive to Pang and cross morai plains and arrive at Tanglangla Pass (5400 M) and enter in Leh Valley. Your further drive will take you to Upsi by crossing river Indus and follow the highway up to Leh. Check in at your hotel and overnight stay at Leh City. After Breakfast, visit Shey & Thiksey Monastery with Leh Palace, Spituk Monastery, Hall of fame, Shanti Stupa. Later, at night head back to the hotel. Today morning, after breakfast proceed to Nubra Valley which is 160 kilometers from Leh via the world famous Khardungla Pass 18360 ft. above the sea level and is the highest motorable road till date in the world. Overnight stay and dinner would be at a Camp in Nubra Valley. Today morning, after breakfast enjoy a Bactrian camel safari (double humped camels) which are found only in the Nubra Valley in India. After that, visit the Diskit Monastery and on the way enjoy the ATV rides. Drive back to Leh via Khardungla pass. In the Evening free to explore Leh market. Overnight stay and dinner will be at the hotel. After Breakfast, check out from Leh & proceed for one of the most beautiful & scenic, salt water Pangong Lake at Spangmik via Changla Pass (17350 ft). Various Bollywood movies have been shot at this lake. One- Third of this lake is controlled by India & rest of the two-third lies under Chinese province. Overnight stay would be in Camps. After Breakfast, check out from Camps for return journey to Leh. Enroute visit Hemis Monastery & 3-Idiots School. Overnight stay will be at Leh. Today after breakfast, checkout from hotel and proceed for Kargil. On the way cover Magnetic hills, Pathar Sahib Gurudwara, Sangam(Confluence of Indus and Zanskar) and Lamayuru . Reach Kargil in the evening, get check in and relax. Overnight stay will be in Kargil. Today after breakfast, check out from hotel and directly proceed for Srinagar via Sonamarg . Reach Srinagar in evening , get check in and relax. Overnight stay and dinner will be at the hotel. Extra Meal other than mentioned in the plan. Any expenses for optional activities or tickets, unless quoted in Inclusions. Insurance, Items of personal nature like, laundry, shopping, monument fee etc. Any additional expenses arising out of unforeseen circumstances like flight delay / cancellation / roadblocks/landslides/ strike or any other natural causes out of human control or any emergency evacuation expenses. Any Kind of Expense for Loss / Misplaced / Theft of personal belongings. 1: How can I join the group? Ans: We have three options for you to join the trip. B. 8 Nights 9 days (Delhi-Leh) – You will be starting your road trip from Delhi in Volvo buses to Manali. From Manali to Leh you would be traveling in SUV cars. If you want a bike you can take it in Leh(extra charges will apply). If you have Shortage of time you can take a return flight from Leh directly to your home. C. 10 Nights and 11 Days(Delhi-Srinagar)- The starting point of the trip will be the Delhi volvo stand(you would be updated with the proper address) and your drop point at the end of the trip will be at the Srinagar airport after completing the entire road trip. 2: How fit should I be for a Ladakh trip? Ans: Say hello to the higher altitudes en route to Ladakh. Due to the difference in the altitude, the weather is always extreme to windy. A good immune system is good to go. Keep yourself packed up with warm clothes. Avoid cardio if you aren't physically fit, the lack of oxygen can cause breathing problems. 3: What kind of accommodation will be available in Ladakh? You will be witnessing different kinds of accommodations during your entire road trip. From a beautiful view from your hotel's room's window to the breathtaking lake view from a camp. 4: What kind of clothing is required for the trip? 5: What will be the average travel duration each day? Ans: Average travel duration is 6-7 hrs each day, besides the journey from Jispa-Leh (10 to 12 hrs). Total it might be around 8 to 9 hours according to the plan. 6: How long does it take to get acclimatized in Ladakh? Ans: The time taken to acclimatization may vary from person to person.For some it might need the whole 1st day for rest and for some, they can just carry on fine. Try to avoid alcohol at least for first three days, and drink water, juice, and tea as much as possible. Keep yourself hydrated enough. 7: Will there be any lack of oxygen in Ladakh? Ans: People with oxygen or breathing problem should avoid traveling to Ladakh. Anybody who is traveling 10,000 above sea level will find difficulty in breathing or is likely to fall prey to altitude sickness. It happens due to the low level of atmospheric oxygen. 8: What are the documents which are required for the trip? Ans: On your Ladakh trip it is essential for you to carry all the important documents with you so that you do not face any trouble during your trip. 9: Will there be any briefing session before we start our tour? Ans: Yes, our organizers will be there with you during your entire road trip. Call out for any kind assistance. They will be happy to help you. 10: Are there any ATM’s in Leh? Ans: ATM is available only in Leh, Manali, and Srinagar. So plan accordingly. No fuel pumps accept cards, so you must have enough cash.